Each passenger is secured comfortably into a seat with safety belts before the driver begins a trip. Our modern fleet of cars, mini-vans and large vans is fully equipped with the latest safety equipment, including GPS technology. Some vehicles are equipped with video cameras and other monitoring devices, as necessary. Each driver is trained in car seat and wheelchair safety. And drivers are skilled in behavior management strategies in order to customize transports in which the vehicle design and seating arrangements are important considerations. 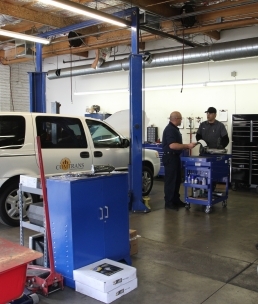 ComTrans has a service maintenance and repair shop near its Phoenix location operated by Community Auto and Fleet Services dba Pro Auto Care & Collision, a company that specializes in fleet maintenance and support. Pro Auto Care & Collision has a team of skilled mechanics who perform all scheduled maintenance checkups, repairs, and also provides preventive maintenance service. Pro Auto Care & Collision is located at 2301 E. University Drive, Phoenix 85034. They can be reached directly at 602-889-3950. 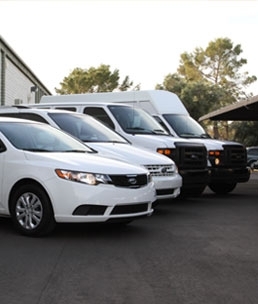 Our vehicles are typically replaced after three to four years of reliable service, so that the ComTrans fleet is continually refreshed with new cars, mini-vans and large vans to ensure passenger safety and fuel efficiency. For information about vehicle maintenance and repair for your fleet of vehicles, click here. ComTrans (the “Company”) is committed to maintaining a drug and alcohol free workplace. A healthy and productive work force, working conditions free from the effects of drugs and alcohol, and excellence in the services provided by the Company are important goals to all. It is well documented that the abuse of drugs and alcohol creates a variety of workplace problems. Increases in injuries, absenteeism, a larger financial burden on health and benefit programs, increase in workplace theft, greater liability exposure and declines in morale are some of the problems caused by drug and alcohol abuse. Use or possession of medical marijuana, or products containing medical marijuana, by a person who has been issued a registration by the State of Arizona. Abuse of legal (prescription or over-the-counter) drugs. Illegal sale, purchase, transfer, manufacture or possession of controlled substances. Arrival for work, or working, under the influence of drugs or alcohol. “Under the influence” means the presence of an illegal drug or controlled substance in the hair or body fluids at levels of detection above the lowest cutoff levels established by the analytical methods of the collection site selected by the Company or, if required under applicable law, at a level that causes impairment. Violation of this policy will result in reassignment, discipline, or discharge, or the Company, in its sole discretion, may allow an employee who tests positive for drugs (without a medical and/or legal justification) or alcohol a single opportunity to complete an approved rehabilitation program. At the Company’s discretion, such opportunity may or may not be provided to employees in safety-sensitive positions. Eligible employees who fail to complete such a rehabilitation program or who test positive for drugs (without a medical and/or legal justification) or alcohol a second time will be discharged. A drug and/or alcohol screening test can be an effective means by which to identify those in need of counseling, treatment, or disciplinary action. The Company's drug and alcohol testing program is intended to supplement, not replace, other means by which the use of drugs and alcohol can be detected. The Company reserves the right to engage in other means to detect the use or possession of controlled substances and/or alcohol such as workplace searches. Tests of job applicants and all employees are required as outlined below. A. All job applicants to whom a job offer has been made must undergo a drug test before their hiring is final. Unless prohibited by applicable law, an applicant who tests positive for the use of drugs (without medical and/or legal justification) will not be eligible for hire. When there is a reasonable suspicion that the employee is impaired or has used drugs or alcohol. “Reasonable suspicion” is based on articulable observations sufficient to lead a prudent person to suspect that the employee is impaired or under the influence of drugs and/or alcohol (including, but not limited to, symptoms of the employee’s speech, walking, standing, physical dexterity, agility, coordination, actions, movement, demeanor, appearance, clothing, odor, irrational or unusual behavior, negligence or carelessness in operating equipment, machinery, or production or manufacturing processes, disregard for the safety of the employee or others, involvement in an accident that results in serious damage to equipment, machinery, or property, disruption of a production or manufacturing process, any injury to the employee or others or other symptoms causing a reasonable suspicion of the use of drugs or alcohol). When an employee is found in possession of a suspected controlled substance or alcohol or when suspected illegal drugs are found in an area controlled or used exclusively by the employee, such as an employee’s locker, desk or workspace. Following an incident in which safety precautions were violated or unusually careless acts were performed. As part of a routine testing program instituted as a result of prior disciplinary action against the employee or as part of a rehabilitation program related to the use of drugs and/or abuse of alcohol. When an employee is assigned to a customer work site where testing is required by law or agreement. When an employee is assigned to a safety sensitive position or which includes tasks or duties that the Company in good faith believes could affect the safety or health of the employee performing the task, or others, the Company may require the employee to be tested for drugs and/or alcohol. When required by state and/or federal law. C. Employees sent to testing pursuant to the first four circumstances above (reasonable suspicion, possession, post-accident, and/or post-incident may (at the Company’s sole discretion) be asked to not return to work until the test results are known and then, only if such results are negative. D. A refusal to submit to testing procedures or a failure to cooperate with the implementation of this policy and the Company’s efforts to maintain a drug/alcohol free workplace may result in discipline up to and including termination of employment. E. Testing will be conducted at the Company’s expense during working hours at a certified laboratory and/or other location as may be designated by the Company. Test samples will be collected with due regard for privacy and an initial enzyme multiplied immunoassay test (or comparable test) may be conducted on the sample. Initial positive results will be confirmed by gas chromatography mass spectrometry or an equally reliable testing method. Test results of the Company designated laboratory and/or other testing facility are considered final. F. Tests may screen for the following substances or their metabolites: alcohol, amphetamines, barbiturates, benzodiazepines, cannabinoids, cocaine, methadone, opiates, propoxyphene, phencyclidine, methaqualone, mood or mind-altering substances, “look-alike” substances, designer and/or synthetic drugs, certain inhalants, and unauthorized prescription or registered drugs. Employees tested should notify laboratory or collection site personnel of information that could affect test results, including identification of currently or recently used prescription or nonprescription drugs. G. Employees must participate in the reasonable suspicion, post-accident, or other designated drug/alcohol testing programs. Employees selected under any of these programs must report to the Company designated collection site within two (2) hours of notification of selection under any of these testing programs. The Company will provide reasonable transportation costs to current employees if their required tests are conducted at a location other than the employee's normal work site. The employee will be required to provide a sample within eight (8) hours of arrival at the Collection Site. A team member’s inability to provide a sample within the eight (8) hour limit may result in termination of employment. H. As to each type of testing, the Company requires that the test results affirmatively indicate a negative result. A test will not be deemed adequate or determinative if the results are either “positive” or “inconclusive.” When a test result is “positive,” the employee must produce medical or legal justification for the test result and the Company, in its sole discretion, may authorize a re-test. When a result is deemed “inconclusive” the Company may, in its sole discretion, authorize a re-test. A. Each employee shall report for drug/alcohol testing as instructed. Failure to report will be considered a refusal to submit to the test. B. Employees must report, within five days, any conviction under a criminal drug statute or criminal alcohol statute, including driving under the influence of drugs or alcohol. C. Employees who are required to use prescription drugs, medical marijuana, or over-the-counter medications are responsible for being aware of any effect such drug may have on the safe performances of their duties. Accordingly, the employee is responsible for asking his or her physician whether the prescribed or registered drug or medication may impair the employee’s ability to perform his or her job in a safe manner. If the prescribed or registered drug may have such an impact, then the employee must report the use of such substances to his or her supervisor prior to reporting for work. When an employee fails to comply with this requirement, a physician’s prescription or certification will not be an acceptable excuse for the use or being under the influence of, or have an impairment related to, such drug or medication. A.The Company will take action on a confirmed positive test result only after receiving a report from its designated testing site or laboratory. Detection of controlled substances (without medical and/or legal justification) or alcohol is grounds for immediate dismissal of an employee. Detection of controlled substances (without medical and/or legal justification) is grounds for a withdrawal of an offer of employment. Upon request, the employee or applicant will be given an opportunity to explain, in a confidential setting, a positive test result, and to substantiate the explanation with medical evidence. The Company, however, reserves the right to impose discipline, including discharge, or withdrawal of an offer of employment to any employee / applicant who violates this policy. Any disciplinary decision will be communicated in writing to the employee and will be accompanied by a copy of the test results. D. In the case of a job applicant, Company may exclude that person from further consideration for employment and/or withdraw any offer of employment. E. An employee who has enrolled in an approved rehabilitation, treatment or counseling program and/or was subject to suspension or other adverse employment action based on having tested positive on a drug-use test or having exceeded .04% on an alcohol-impairment test, may be immediately terminated if such employee subsequently tests positive on a drug or alcohol-use test. If you suspect your driver to be under the influence, report immediately HR Manager, Mona Lee at 602-231-0102 ext. 124.